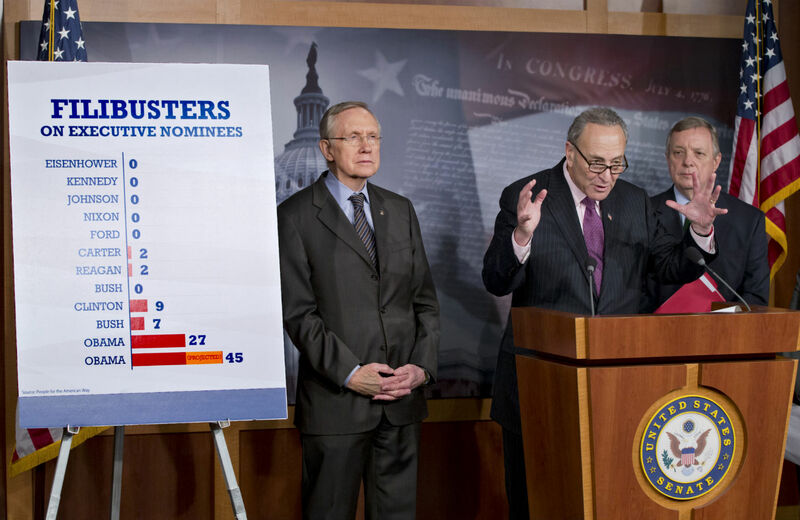 Make no mistake—filibuster reform is good not just for governance but for progressive policy. In many senses this is a crazy thing to say; as scholars of the Senate correctly note, Thursday’s maneuver simply returns the body to its constitutional and historic norms, wherein the president is able to effectively staff the executive branch and federal judiciary. The sixty-vote threshold was a relatively recent aberration, wielded to the extreme by the Republican minority in the Senate. But in practical context, Heritage is actually correct. Filibuster reform is a victory for progressive politics. In short, the filibuster provided one more pump-brake on the slow but sure recent leftward trend in American politics; it was of utility only to the minority party, which is of course the ossifying, conservative GOP. The people in the room and the outright celebratory nature of the meeting belied the true ramifications of Thursday’s rule change for progressive politics. The Senators entered to thunderous applause and more than a few hoots and hollers, and behind their podium stood many members of the Congressional Black Caucus and representatives from a wide array of progressive groups like, for example, the Sierra Club. Many people in the room were responsible for mobilizing public support for a relatively obscure Senate rule change—groups like Democracy for America, CREDO Action and Daily Kos, which arrived at the meeting with 285,000 signatures supporting filibuster reform. Progressive organizing was indeed crucial to changing the filibuster, with Senators like Merkley and Udall working the inside game while the outside groups got the public riled up. Many Democratic senators—including Reid—didn’t want to do rules reform back in 2009 when the GOP began its unprecedented obstruction, and it took a lot of convincing. They were candid about this fact during the Thursday meeting. “There were some people that needed to be convinced, and—we don’t need to go into that—but they are convinced,” Harkin said, as the room erupted in laughter. Though the assembled progressives were ebullient, they also hinted that the push wasn’t over. Progressive legislation, too, has often fallen victim to the filibuster. Few people remember that, before Republicans took over the House, Democrats passed out a cap-and-trade climate bill and the Disclose Act, a major piece of campaign finance legislation—both of which died in the Senate despite a Democratic majority. “But I am also looking forward to the moment when we can have legislation come to the floor of the US Senate and have a fair chance of getting an up-and-down vote, to do right by working Americans,” Merkley concluded, and left the podium to raucous applause. Todd Gitlin on how students are leading the fight against climate change.